These yummy burgers were heavily inspired by a recipe I found in Isa Chandra Moscowitz’s cookbook called “Isa Does It!” Such an amazing collection of delicious vegan recipes that are fun to make as well as healthy. 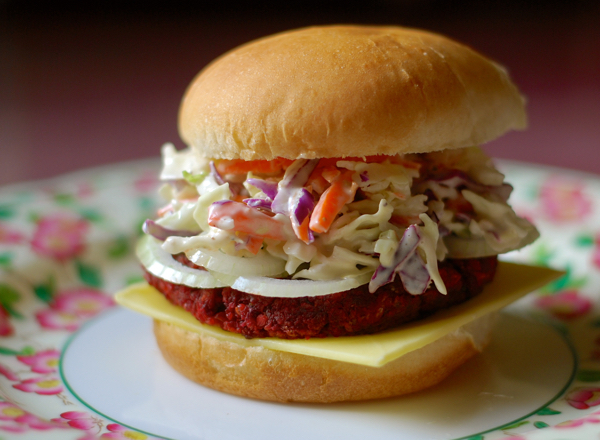 These are my favorite veggie burgers! No contest! Oh, and I doubled the original recipe so I could freeze half. They thaw and reheat in the microwave beautifully. This double recipe makes 12 burgers. Transfer this mixture to a large mixing bowl. Add bread crumbs, onion, garlic, almond butter, mustard, and spices. Use your hands to mix very well. Place mixture in refrigerator for 30 minutes to chill. Preheat a non-stick grill pan (or a large cast-iron pan) over medium high heat. The original recipe calls for a cast iron pan, but I LOVE how these burgers cook in my IKEA grill pan! And those grill lines add a little something, don’t you think? Anyhoo, now form your patties into 3/4 inch disks. I just do this with my hands. Isa uses a round cookie cutter. When I tried this they got stuck, and I swore every time it happened, so I just chucked the cookie cutter and molded them myself. They look great in my opinion, but do what you like. 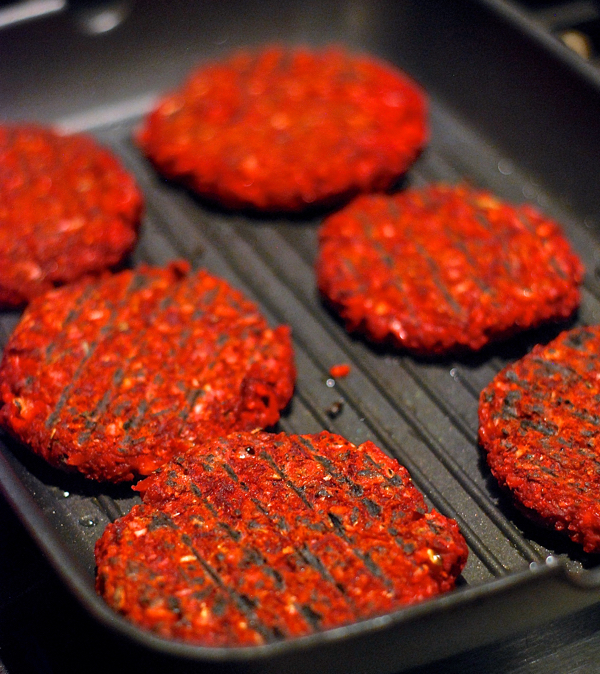 Pour a thin layer of oil in pan and cook patties for 12 minutes, flipping occasionally. Drizzle a little more oil as needed. You want them charred on both sides (not burned) and heated through. Serve warm, on buns, with your favorite toppings! This time I used a slice of Chao cheese, thin slices of fresh onion, and slaw mixed with JUST Caesar Dressing. So good!